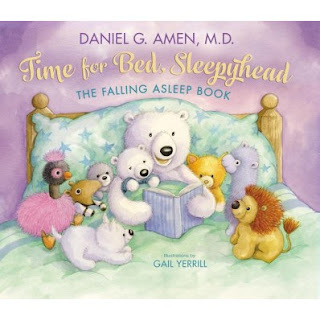 Time for Bed, Sleepyhead: The Falling Asleep Book - Daniel G. Amen, M.D. Written by New York Times bestselling author and renowned psychiatrist Dr. Daniel Amen, this cozy bedtime book uses visualization techniques in the storytelling to encourage a child to stretch and even exhaust their imaginations to help them drift off into peaceful sleep. ourselves yawning while reading this to our children, not because it was boring, but because the book was working on us as well as our kids. While the story is great at getting the kids to exhaust their imagination and get sleepy, there are a few pages that are a little long, but not overly so. Beautiful illustrations and a fun story. Overall both my husband and I, and our two boys (ages 4 and 2) enjoyed this book and have added it to our nighttime routine. I received a free copy of Time for Bed Sleepyhead from Zonderkidz in exchange for my honest review. All opinions expressed are mine alone. The Washington Post called Daniel Amen, MD the most popular psychiatrist in America and Sharecare named him the web’s #1 most influential expert and advocate on mental health. Dr. Amen is a physician, double board certified psychiatrist, television producer and ten-time New York Times bestselling author. He is the Founder and Medical Director of Amen Clinics in Costa Mesa and San Francisco, California, Bellevue, Washington, Reston, Virginia, Atlanta, Georgia and New York, New York. Gail Yerrill lives in a village in Bedfordshire, England. She has illustrated and designed products for Marks & Spencer, Harrods, and the BBC among others. Gail has illustrated many children’s books, and is known for her soft, whimsical style which is well loved by children and adults alike.